I'm joining in Altered Book Lovers Second on the 2nd - a chance to look back at one of my favourite blog posts. If you cick on the image below it'll take you to see who else is joining in. I've chosen this one that I posted on 10th April this year, partly to remind me that the piece I talk about still needs finishing! 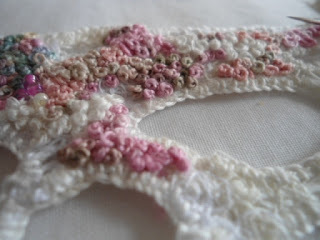 I'm adding french knots and the occasional bead to my scrim lace. I'm using a mixture of white and hand-dyed fine embroidery threads. It's reasonably straight forward, but time consuming, so it'll take a while for me to finish. The last three photos are of my net fme lace. I've added buttonhole lace around a couple more holes and started to add the off bullion loop. This piece will be another slow burner, taking time to complete, so it's a good job that I haven't a completion deadline for both of these pieces! Wow! Such intricate needlework. Really beautiful. Quality handwork takes a long time but is worth the hours. Show is when you finish the pieces.